You think times are tough today? They are going to get tougher. We aint seen nothin’ yet! With poverty on the rise, lack of affordable housing, lack of good paying jobs, significant rates of youth unemployment, etc., the future looks grim. Tensions are imminent in society when people feel a sense of being marginalized. Othering becomes a convenient scapegoat. Those in positions of power find an opportunity to manipulate the masses without any rhyme or reason and irresponsibly fuel racism and discrimination. Ideologies are intentionally made to clash to polarize and pit Canadians against one another. A divide and conquer tactic from our colonial past is cutting through the very fabric of our heart as a nation that values individuality, human dignity, and diversity. A miniscule number of women are labelled, contradicting Canadian values and distracting us from matters far more important. Our tax dollars are wasted in a war of words and legalese when we have bigger concerns. A piece of cloth worn or not worn is not the issue. Rather, power, privilege, and gender equity are on the line. As the forever optimist, I am checking in with reality and insisting not to sit back and let it happen to us equity seeking groups. More than ever before, strong leadership for a society that is truly inclusive is necessary to ensure our Canadian values are kept intact. As women, as women of colour, as women who choose to outwardly express our faith through our attire, it is more important than ever before that we speak publicly for ourselves. Growing up in Mississauga, I have benefitted from a Canada that opened its door to immigrants. If I grew up anywhere else in the world, I would not have had the quality of life I enjoy today. I had access to education and hence access to employment, family and community. As a racialized woman with a disability, I was even empowered to explore my spirituality and choose to visibly express my faith when I graduated from UTM in 1993. Yes, I chose to wear the hijab. No one imposed it on me. Today, I am a married mother of 4, a career woman, an activist and candidate in a municipal by-election. I made my parents’ Canadian dream into a reality. Recognizing this fact, I have dedicated my life’s work to making my neighbourhood, community, and society a better place for all. I live and breathe access, equity, and inclusion valuing the fact that I live in a society where I am free to believe. We are free to believe, but our behaviour in the public arena is an implicit social contract governed by set values determined through prohibited grounds of discrimination as defined by fundamental human rights in our provinces and country. 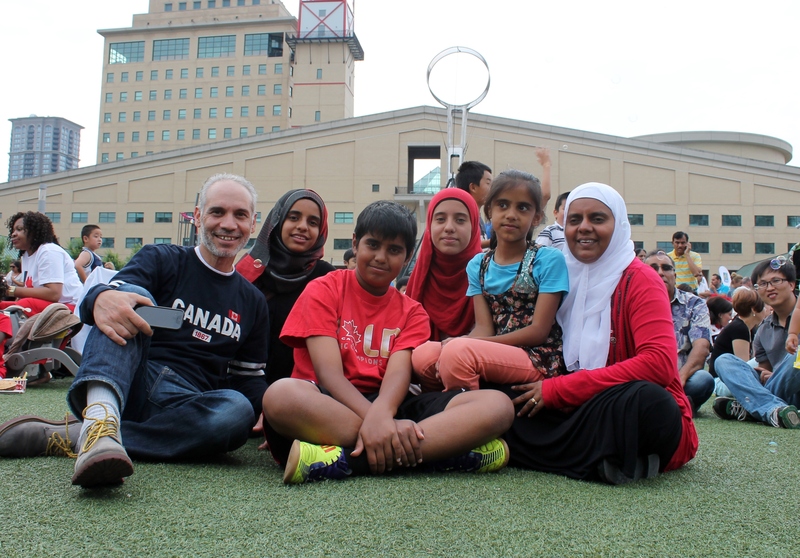 My Canada is where every individual belongs and shares in the benefits that society has to offer. Our older adults, children, youth, women, newcomers, people with disabilities and diverse cultural and faith communities have to feel a sense of belonging. As community leaders and activists, we have to do our part to ensure that all voices are heard as decisions are made that impact people’s lives. I am not so blind to ignore the fact that seeds are being rooted top down that will fuel racism, demonization, and dehumanization of Muslims. In a rights-based society, it is my duty, it is your duty, it is our duty to make sure that the Charter of Rights and Freedoms and Human Rights Codes reign supreme if we want to preserve and protect the Canada we grew up knowing and loving. So let’s put our hands and hearts together and say, “My Canada includes everyone. We are going to make it happen.” Yes, we can. And we will for the sake of generations to come. Rabia Khedr is Candidate for City Councillor, Ward 4 Mississauga (www.rabiakhedr.ca), Executive Director of the Canadian Association of Muslims with Disabilities (www.camd.ca) and Board Member of the Federation of Muslim Women (www.fmw.org).